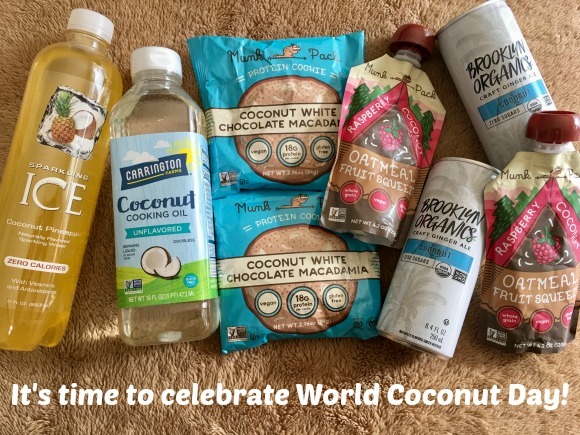 Stacy Tilton Reviews: It's time to celebrate World Coconut Day! It's time to celebrate World Coconut Day! Okay I will be honest I had no idea there was even a such thing as World Coconut Day. But now that I do I think it's a pretty cool thing. And it gives me a good excuse to make my husband some of his favorite coconut filled treats. Also known as the "Tree of Life" for its ability to produce a number of things ranging from foods and beverages to kitchen tools and oils, coconuts are incredibly resourceful! Brooklyn Organics Coconut Craft Ginger Ale is perfect for those looking for the light flavor of coconut, but also a bold fizz. USDA Organic-certified and gently sweetened with plant-based Stevia, Brooklyn Organics is made with ingredients that are good for you and for the planet. An excellent soda alternative, Sparkling Ice Coconut Pineapple is slightly carbonated with B-Vitamins, Vitamin D and antioxidants. This light and refreshing beverage contains Zero Calories, Zero Carbs, is Gluten Free, and Sodium Free. Great to enjoy in your favorite cocktails or as a refreshing snack! Munk Pack produces convenient on-the-go nutrition made with high quality real ingredients. Munk Pack features the sweet taste of coconut in both product lines with a Raspberry Coconut Oatmeal Fruit Squeeze, and a Coconut White Chocolate Macadamia Protein Cookie, offering consumers two delicious options to enjoy the tropical flavor of coconut. I would be happy to celebrate World Coconut Day! I am a big fan of coconut products. I have tried the Sparkling Ice and would like the other products in the photo also.